This was my first game of Kings of War, and my first serious foray into miniature wargaming since I collected about 750 points of 40k Tyranids about 14 years ago. My mate Oldy got me interested in this particular game, and I picked up the rulebook at Cancon. After a solid read through I was convinced. I am currently painting up an army of Elves. I really enjoy painting and modelling, but it will be a couple of months at best before my Elves are ready to play with. Happily, I managed to pick up a second-hand Warhammer Fantasy Empire army for an absolute steal on Monday. After a few evenings spent dusting I had the models all multibased (blu tack and cardboard yo) ready for a KoW game. 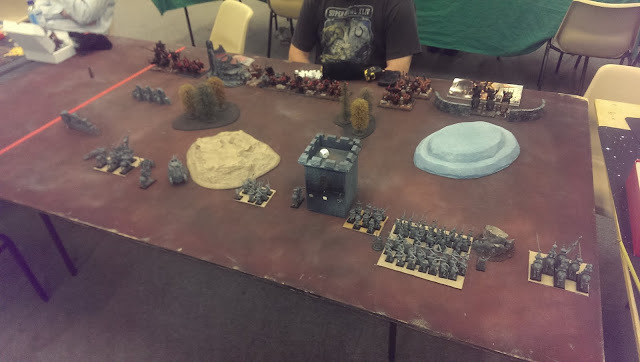 We played at one of the two FLGS' that run casual KoW games, Three D6 in Tuggeranong. 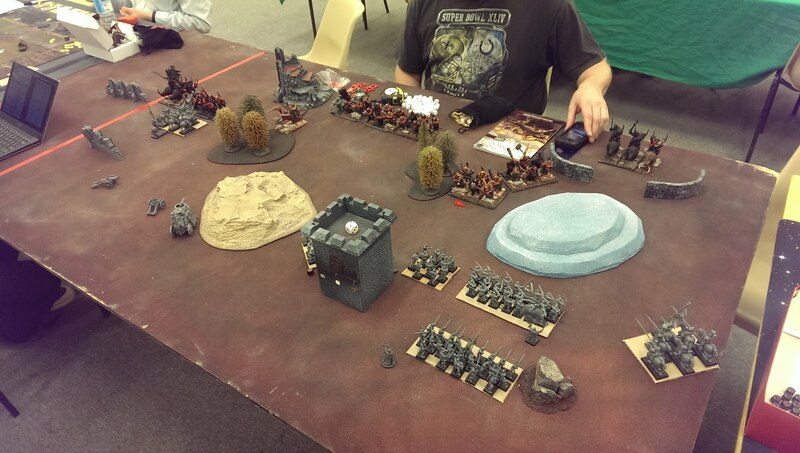 Great set up, friendly crowd of regulars, nice big selection of terrain to use. I tinkered quite a bit with my models to come up with this list. There are some units that I would have liked to run, but do not (yet) have the models for. Down the track I think I would like another war engine, and some mounted scouts. Wizard with Lightning instead of Fireball, with Bane Chant and Scrying Gem. We rolled the Invade! scenario. At the end of 6/7th turn, you add up the value of all units you own that are completely in your opponent's half of the board. Highest score wins. 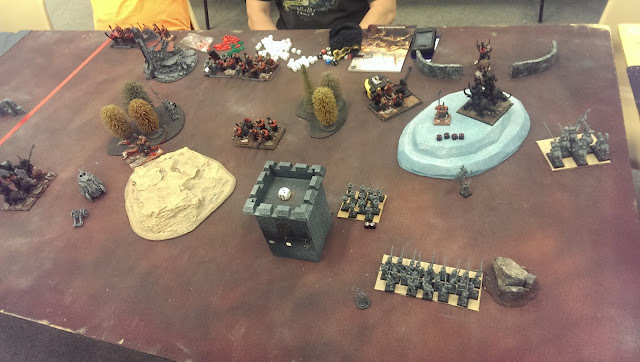 Not a great deployment by me, despite the magic items I had taken to give me the advantage in this phase. 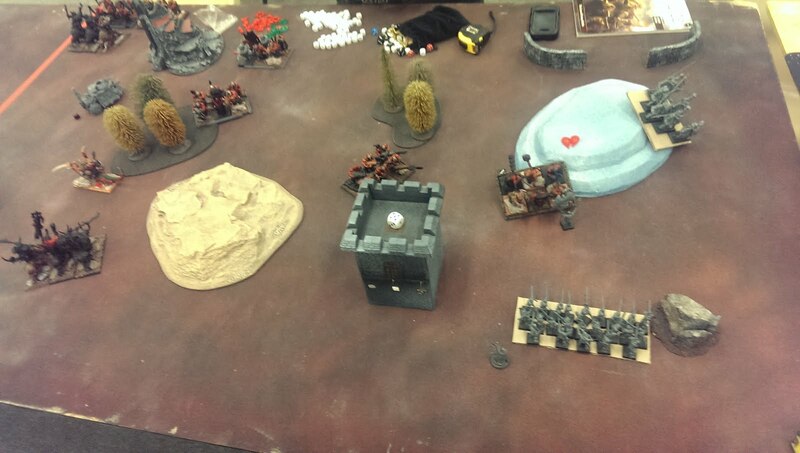 My halberds and mounted standard bearer in the center were just wasted. Should have left the Shooter's firing zones completely empty, to force a move. This 1v2 engagement on my far left flank is where I lost the game. Should have gone in with the steam tank as well. Heavy loss for the Westhaven Militia. His Ogre Chariots just rolled up my left flank, my center was shot to pieces. 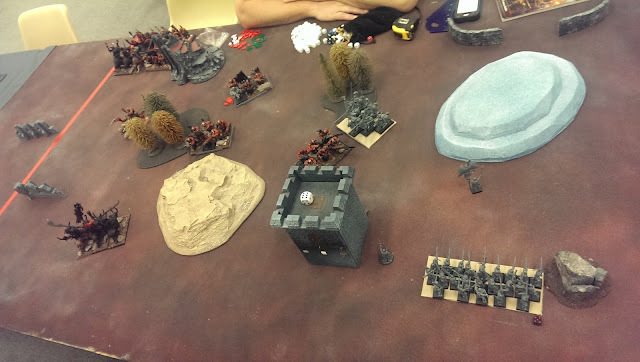 My right flank did much better, but not enough to compensate. What worked? My shooting. The war engines and handgunners did basically all of my damage, each killing 2-3 times their points value. My Landgraf's Own Knights got some good flanking positions in. The extra speed was very useful. My Foot Guard Horde were about average, tanking over 20 wounds before they were routed, but doing no damage themselves. What didn't? I deployed valuable units in the Shooters' fire zone, and they died for nothing. I engaged in a 1v2 situation with my Tyger Knights. My individuals were quite ineffective. My steam tank was wasted. I'm not sure Scrying Gem helped all that much. I certainly didn't take full advantage of it, or the redeployment that I gained from taking The Captain. Had a ball. Can't wait to play again. I'll play a few more games with this list before I tinker with it again.